I would like to dedicate this blog article to my very dear, very creative friend Gina. I also promised you another article on antique German grain sacks, so here we are. Gina helped me create the Amstetten pillow pair above. She also re-created the fabulous wing chair. 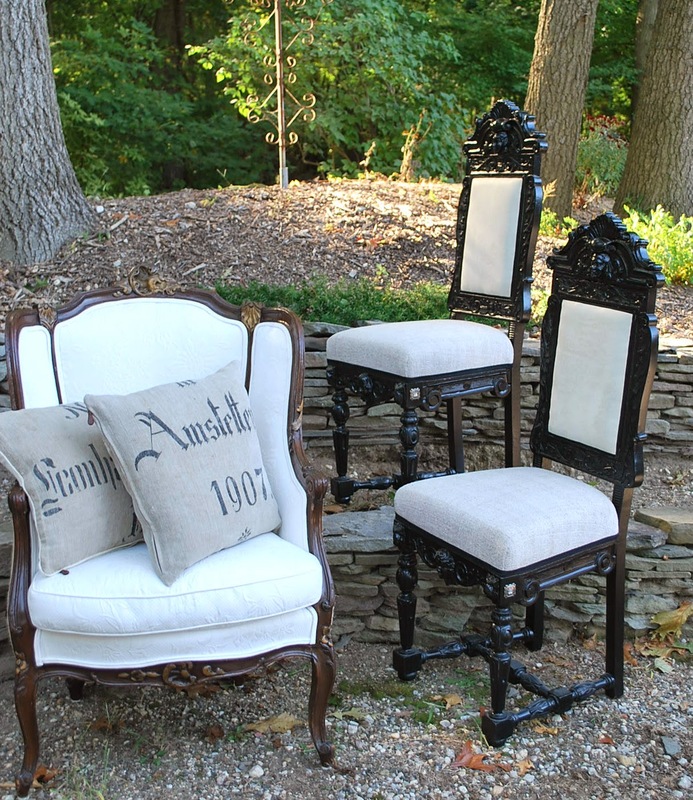 And together we designed the black Gothic style antique chair pair. The genuine antique grain sacks (there have been many reproductions, but none could replicate the beauty of the true originals) were created by carving wooden blocks with painstaking detail, then dipping these blocks in hot tar and burnishing these tar stamps into hand woven homespun linen. From those, we made the pillow pair you see. Next to that, the pair of chairs were antiques from a friend. Gina refinished them in black, and then we covered the seats in antique European homespun. The tops are backed in pearlescent leather. WOW! I added just a touch of "bling." Do you see the little square crystal? It's all in the details... and I am the "bling" part of our duo. Our pillow is filled with soft and crunchy feather down. This particular example has a very, very rare blue stripe. Gina upholstered the back of this antique wing chair in such a fantastic rough and textural weave, and then outlined it in braided jute. 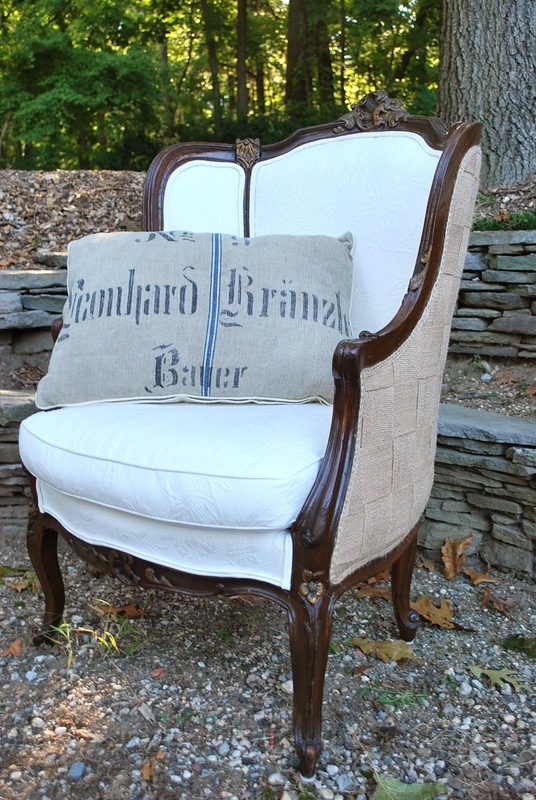 This is a throw I created from an antique European grain sack that was in pristine condition. I love that the grain sacks were so pain-stakingly created. The finest examples must have taken dozens of hours to create, and are intricately detailed, beautifully stylized, balanced and graphic works of art. I also love the textures. Most are nubby, and they range from the very soft to much more coarse. This one is a fine, soft texture. Here, we sewed the antique grain sack onto another antique European textile: an antique French sheet made of the softest homespun linen. Let's not forget that all this homespun was also hand made. First the flax was grown in the field, then it was woven into herringbone, twill or other patterns. The fine detail of yesteryear. A French woman from the 19th century cross stitched her initials in red. I always incorporate these details into my pieces. They add such an authenticity. Gina hand stitched the vintage leather border onto this throw. Gina has carried on the centuries-old art of fine stitching and hand work. The women of the 18th and 19th centuries hand made everything with such finesse. I love to work with women of today who are equally as talented, creative and attentive to detail. A welted border completes the blend between the antique French sheet and the antique German grain sack... hand woven by women more than 100 years ago, and re-created and hand-stitched into a beautiful throw by today's talented and creative women. I am thankful for my many wonderful and dear friends. Gina, Barbara, Katherine, Francesca, Lisa, Linda, Doreen. I love you all. Have a beautiful and thankful Thanksgiving. And thanks for checking out my blog. I am an interior designer with a passion for antique, time worn fabrics. My inspiration comes from French provincial homes, the lights of New York City, and the barns where I ride. I combine antique French, Swedish and German textiles to create my own home furnishings line. My blog is named after a Belgian though.... my Belgian Shepherd, Lily! Hey, Belgium touches France right? I hope you enjoy what you see. IIF YOU'D LIKE TO RECEIVE THE LILY HOME IN YOUR EMAIL BOX, JUST LEAVE YOUR ADDRESS HERE!